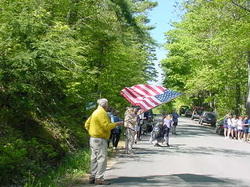 Willsboro, May 25-- Running a nearly flawless, inspired and dominating race, Jim Kobak captured the 2002 Patch Sprint, securing an easy victory while setting a new course record at the annual endurance race, held on the mountains and trails around Long Pond. Kobak’s time of two hours, 20 minutes and 24 seconds bettered his previous course record, while his spread of greater than ten minutes over runner-up Ben Stanley marked the second largest margin of victory in the history of the event. Kobak’s decisive win of both the overall title and the open men’s division signified the successful conclusion of a year-long mission. Following victory in 2000, the Peru native suffered cramps one year ago, dropping back into fourth place. Since then, he has dedicated his life to recapturing the title. His training regiment included sprints, tempo runs, long runs, mountain climbing and cross-country ski racing. 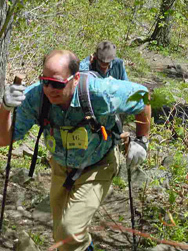 While some minor cramps very late in the race prevented Kobak from reaching his stated goal of two hours, twenty minutes, his finish time impressed all of the 50+ people gathered on the summit of Mt. Pok-O-Moonshine, and is a new record that will be hard to beat. Kobak’s race to victory, though extraordinary, was no surprise to racing experts, but Ben Stanley’s second place showing was nearly as remarkable when considering the factors involved. One year ago, Stanley was 30 pounds heavier and running was the farthest thing from his mind. 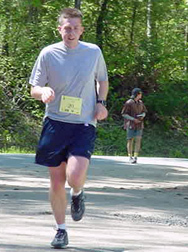 Yet, he managed to not only get in shape, but finish second in a time of two hours, 30 minutes and 27 seconds, the fifth fastest time in Patch Sprint history. Even more impressive is the fact that the 20-year old from Irvington, NY accomplished this in his first ever Patch Sprint, running alone over a course that traditionally gives newcomers a tough time. Third place went to veteran Matt Elliott, 24 of Boston, in a time of two hours, 33 minutes and 36 seconds, bettering his 2001 time by three minutes while dropping down one position in the increasingly strengthening field. Newcomer Chris Durlacher ended up fourth, while Mike Horwich secured his first top five finish. 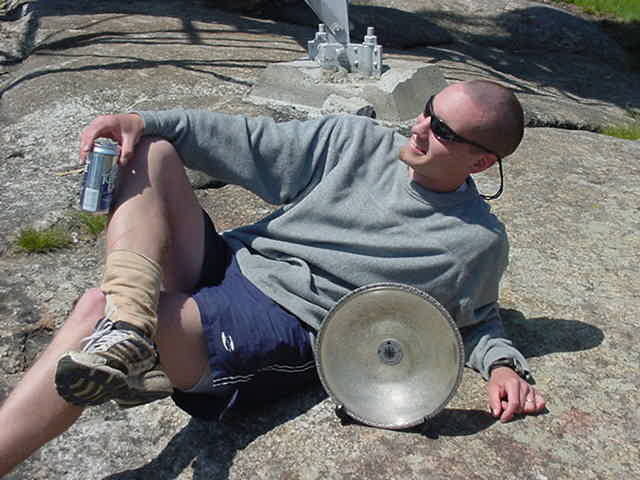 By crossing the finish line first, Jim Kobak assured himself of possession of “The Janny”, the coveted trophy signifying the overall champion. However, titles were awarded in other divisions. In the relay field, the all-female squad of sisters-in-law Amy Daley-Kobak of Peru, and Samantha Daley of Nashua, NH won the event by nearly two hours over their closest rivals. 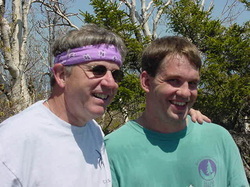 Additionally, the first ever master’s division was captured by Tom Lynch of North Andover, MA, who was also sixth overall in the race. Several racers who were expected to compete for the top spots had to withdrawal from the race for various reasons. Most distinguished of these were defending open men’s and women’s winners Jason Fiegl and Judy Bisaillon, both recovering from injuries. 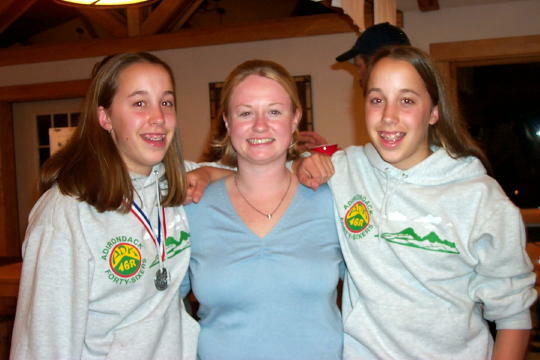 However, both 2001 champions were on hand at the summit of Pok-O to greet the new champions and take part in the awards presentation. Meantime, two-time race champions Tim Singer and Greg Henderson were also scratched. Singer, recovering from a throat infection, did not race, choosing instead to “cover the course at a leisurely pace.” By finishing, he extended his record string of most successful completions of the race course. 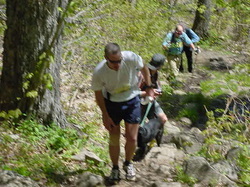 Henderson, having trained diligently and expected to compete for second, if not the overall win, had to drop out early in the race following a severe ankle sprain suffered on the descent of Bare Mountain. 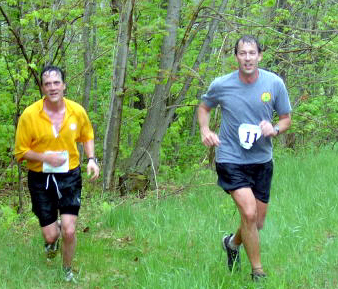 “One of the great things about the Patch Sprint,” said 2001 champion Fiegl, “is that everyone runs a little differently, but everyone has fun.” And run differently they did! Amber Taylor of Swift Current, Saskatchewan, racing for the Riding Staff/PMOEC relay team, swam one leg of the relay for the second year in a row….. After leaving most of his breakfast on the top of Rattlesnake, Phil Maher regrouped to finish in the top ten….. Bob Heins, at 62, became the oldest person to successfully complete the course…. The sportsmanship award goes to Matt Elliott who, despite trailing second place Ben Stanley midway through the race, pointed out to Stanley that he was making a severely wrong turn. These are just a few of the anecdotes surrounding the latest edition of the North Country’s most prestigious race. Despite the withdrawal of the some racers, the 2002 edition of the Patch Sprint proved to be the biggest yet. 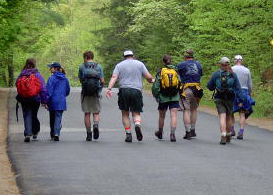 23 runners took part in the racing divisions while eight completed the course as trekkers. Furthermore, the assemblage of volunteers and spectators helped to create a party atmosphere, which only served to spur the racers on, and insure a festive day for everyone.